There's supposed to be a large-scale war going on during The Walking Dead's current season, but most of the time, you wouldn't know it. Aside from the action-packed premiere and explosive mid-season finale, there have been few battles to speak of and the subplots are beginning to feel drawn out. 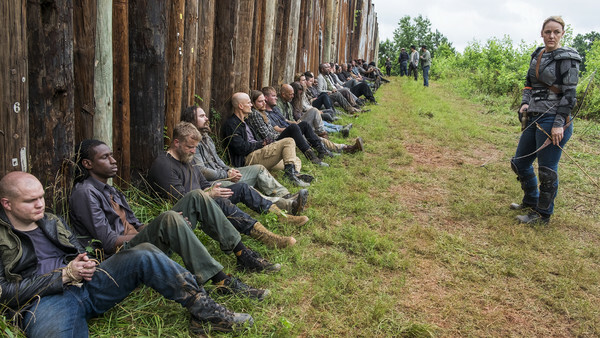 Building up to the set pieces is fine, not to mention necessary, but season 8 has crawled along at the pace of a walker with its bottom half missing. In story terms, only a handful of days has elapsed since the opener. Character arcs and the conflict between Team Rick and Negan's Saviors hasn't moved on enough. Too much of the story is unfolding in real time or standing still. Cast your mind back to the all-killer-no-filler Season One in which Rick travelled hundreds of miles to reach his family. Viewers didn't need a minute-by-minute breakdown of his journey. The writers simply cut to the chase, giving the story the tension and urgency it needed. Season 8 has so far been robbed of this momentum and that must change. It's time to pick up the pace and start streamlining those subplots. All of season 8's developments involving Ezekiel and Kingdommers, and Maggie over in the Hilltop Colony needed no more than a single episode dedicated to them, with the rest of the runtime invested in the overarching war. This is an event that's reshaping Walking Dead's universe, yet there are times when it feels like it's almost on the back-burner.